Photos by Alan Weir (AW) and Maynard Collins (MC). 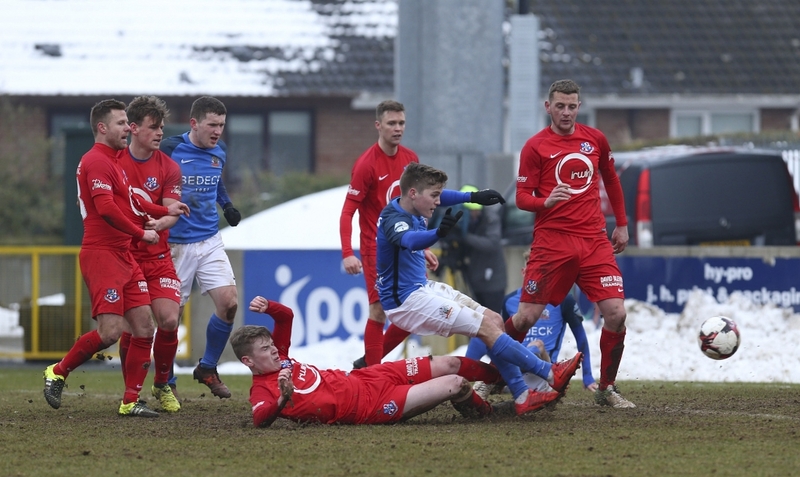 Glenavon slumped to a shock 2 – 1 defeat to Championship side Loughgall in Saturday’s Irish Cup quarter-final at Mourneview Park. 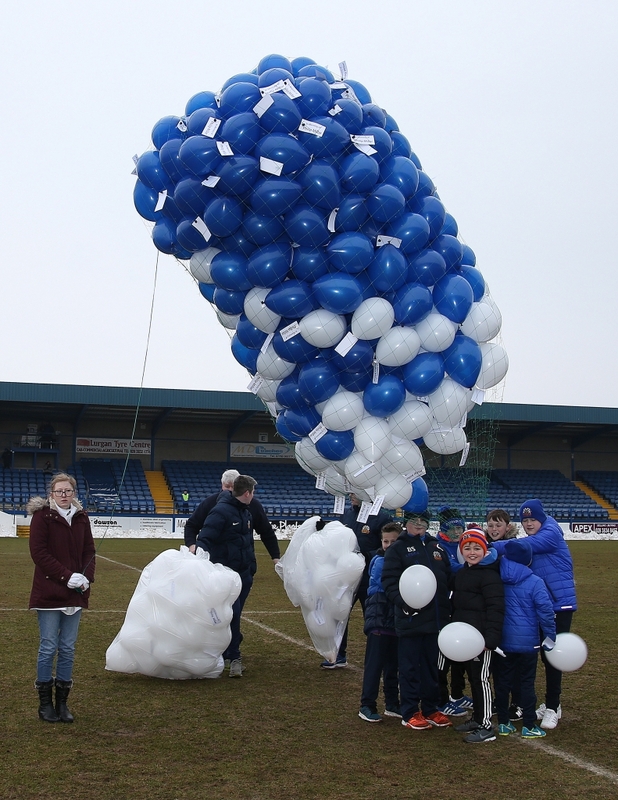 Supporters and club officials went to a mammoth effort to clear snow off the Mourneview pitch to ensure that this was the only quarter-final tie not to be postponed at the weekend, but the surge of pride that this generated around the ground in the build-up to kick-off had given way to a sense of disbelief come five o’clock as it began to sink in that the Lurgan Blues would not be in the hat for the semi-final draw. Dale Montgomery put Loughgall ahead shortly before half-time, just moments after Jonathan Tuffey had saved Gary Liggett’s penalty. 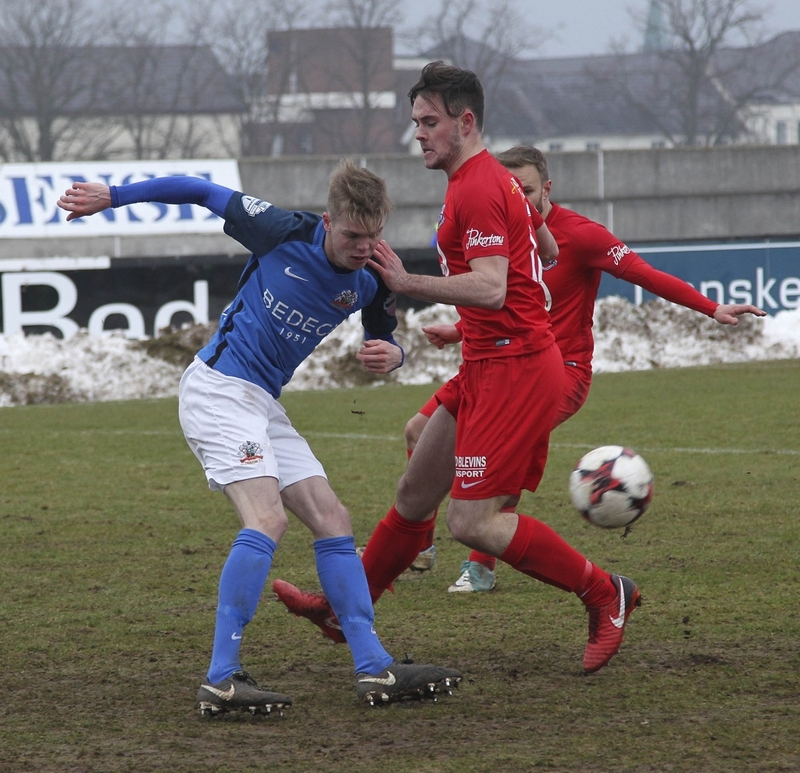 Former Glenavon striker Liggett made up for his missed spot-kick by firing in the visitors’ second, and what proved to be the winner, 10 minutes from time. 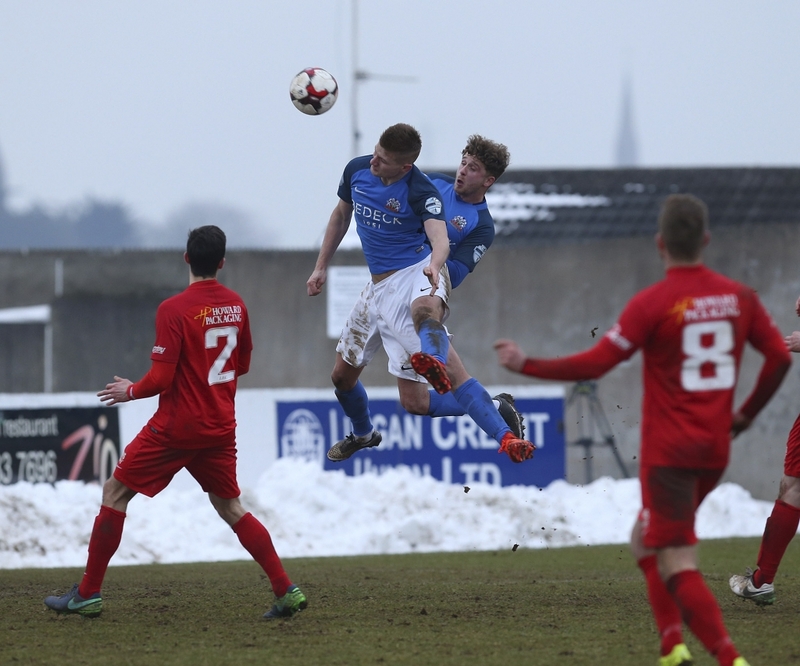 James Singleton pulled one back for Glenavon in the 89th minute, but Loughgall held on for a famous victory. 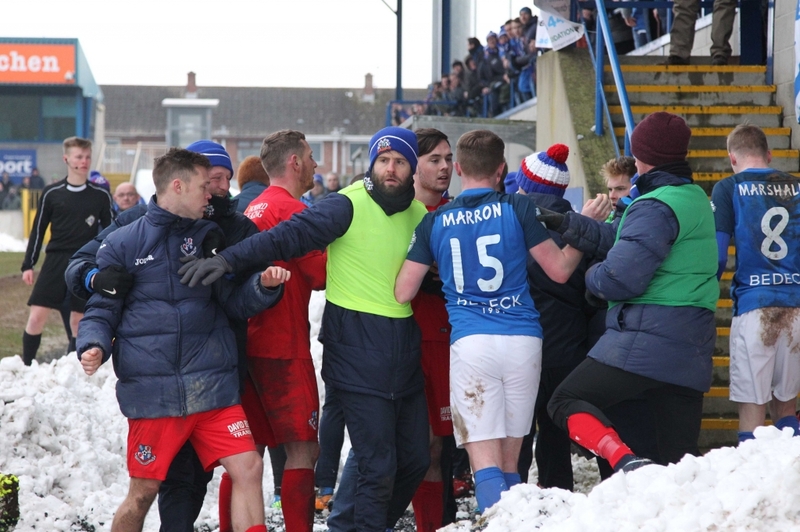 Each side also had a substitute sent off, Stefan McMaster of Loughgall and Simon Kelly of Glenavon, following an ugly touchline brawl near the end of the game. Loughgall’s Andrew Hoey had the first effort of note. 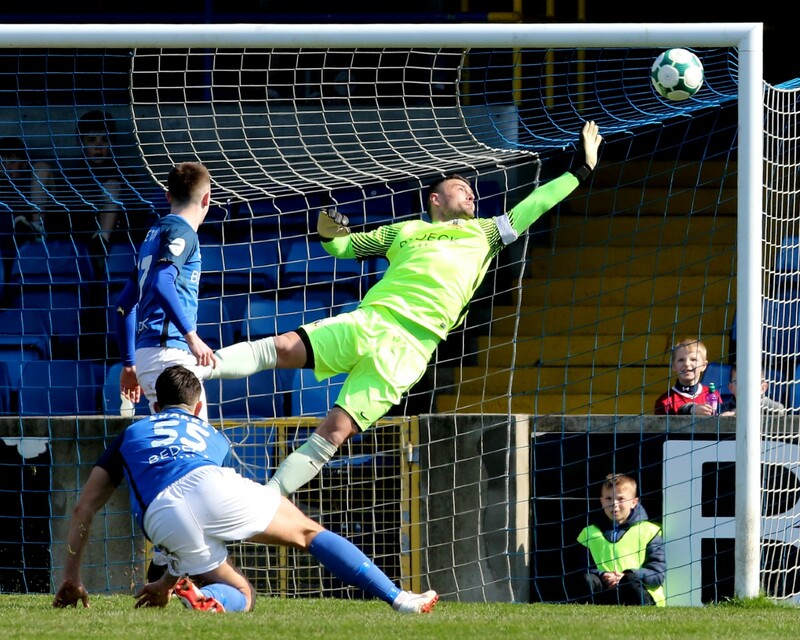 He turned smartly just outside the Glenavon penalty area in the fifth minute, stepping inside Sammy Clingan and Caolan Marron, then fired a low shot in with his right foot. Tuffey did well to dive down to his right and make the save. 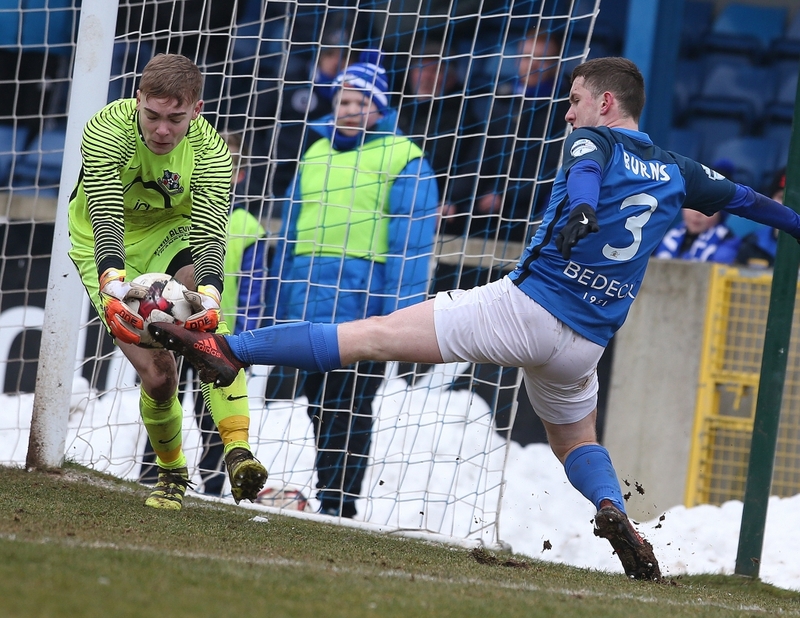 Five minutes later Rhys Marshall had a very good opportunity to put Glenavon in front. The ball came out to Clingan following a Bobby Burns corner. His effort was charged down by Marcus Dallas, but the ball fell to Daniels, who drove a low cross in from the left side of the penalty area which picked out Marshall. The full-back mishit his left-footed effort and the ball spun up for teenage goalkeeper Craig Robinson to make an easy catch. On the half-hour mark Burns fed the ball in to Mitchell inside the penalty area. He spun smartly and got a shot away with his right foot, but he could only send the ball over the top. Five minutes later Mitchell did put the ball in the net, only for it to be ruled out for offside. McGrory played a ball down the right flank for Burns to run onto. He cut inside centre-back Mark Stewart and struck a low shot with his left foot. Robinson made the save, but he could only palm the ball into the path of Mitchell, who tapped it in. However, he was clearly standing in an offside position when Burns hit his shot. On 36 minutes Liggett then had an effort ruled out for offside for Loughgall, but three minutes after that he had an excellent opportunity to open the scoring when referee Tim Marshall awarded the Villagers a penalty for Josh Daniels’s clumsy tackle on Peter Campbell. Liggett’s penalty wasn’t well struck, and Tuffey dived to his left and made the save, pushing the ball behind for a corner in the process. Loughgall weren’t to rue that missed opportunity, because they scored from the resulting corner. Campbell delivered the ball from the right and it fell for right-back Montgomery at the far post. He took one touch to control the ball, then fired a powerful shot in with his right foot to make it 1 – 0 to the visitors. 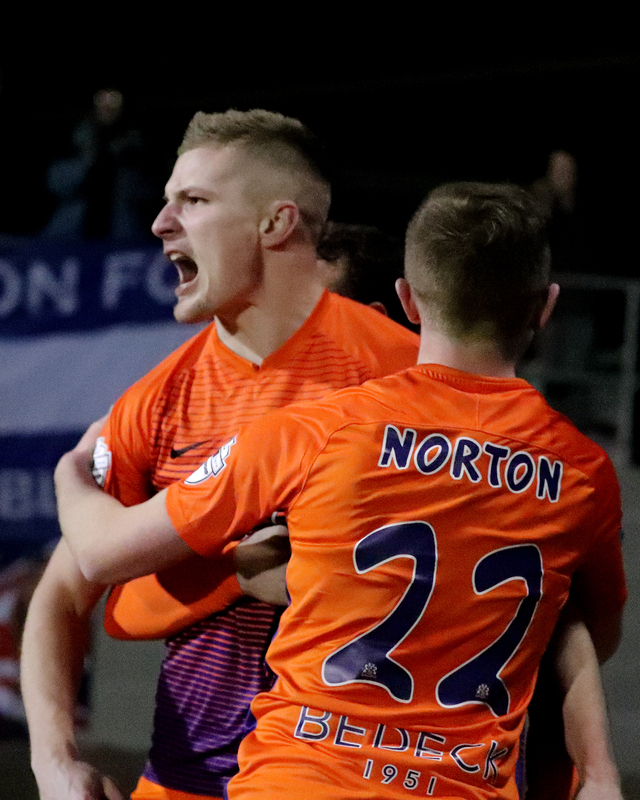 In the opening minutes of the second period Glenavon were awarded a free-kick close to the left-hand edge of the penalty area when Cooper was brought down cynically by Montgomery. Clingan whipped in a wicked delivery which Robinson had to push over the top. 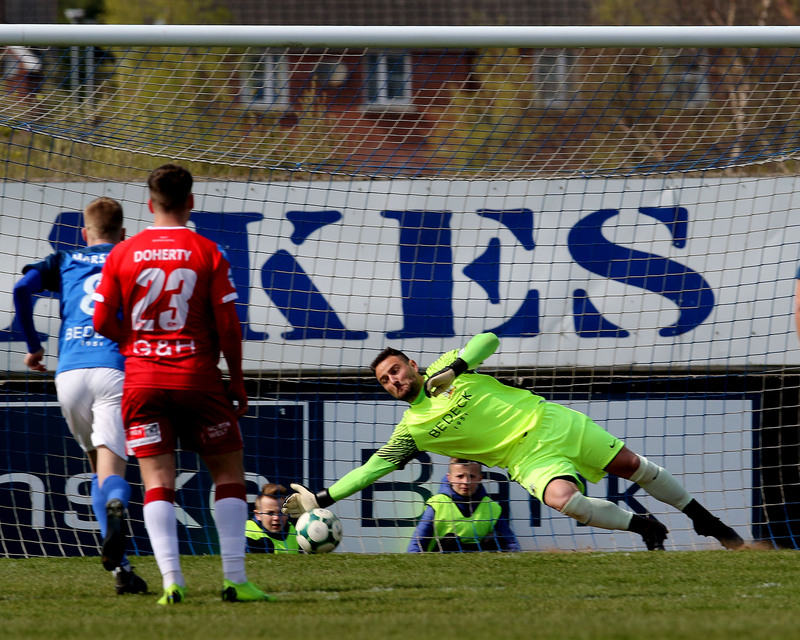 Mark Sykes then had a glorious chance to draw Glenavon level on 51 minutes. He cut out Steven Ferguson’s pass and the ball fell to Mitchell, who played a smart ball into the path of Burns. Burns then played a neat back-heel for Sykes which sent the midfielder clean through on goal, but he could only hit his tame shot straight at Robinson. In the 70th minute Singleton played an excellent cross in from deep which picked out Mitchell, but the striker couldn’t get enough power on his header to trouble Robinson. Three minutes later substitute Eric Foley went close with an audacious effort from a free-kick which was all of 35 yards out. Loughgall doubled their lead in the 80th minute. Marc McConnell sent a corner over from the right. The ball fell for Hoey and he struck a venomous shot on the half-volley which Tuffey somehow managed to keep out with a fantastic save. The ball then went to substitute Nathaniel Ferris. His shot was blocked on the line by Marshall, but it bounced up, struck the post and fell for Liggett, who swept it into the net to send the travelling support into raptures. Five minutes from time an ugly brawl broke out close to the Loughgall dugout when Singleton was preparing to take a throw-in. Referee Tim Marshall dismissed McMaster from the Loughgall bench and Kelly from the Glenavon one. 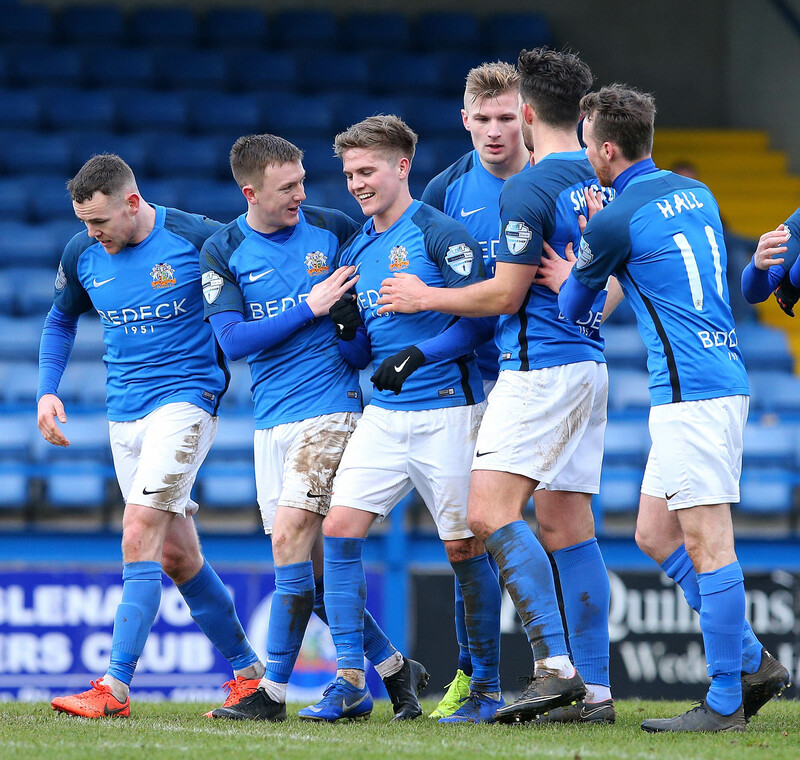 Glenavon pulled a goal back in the 89th minute when Singleton headed in Foley’s corner, and when the fourth official indicated soon after that there would be five minutes of injury time, hope arose among the home supporters of a last-gasp equaliser. There was time for one final chance. Deep into stoppage time Cooper floated a cross in from the left. Mitchell got on the end of it, but he headed the ball over the crossbar when Griffin looked to be in a better position just behind him to convert the opportunity. Loughgall held on for a famous 2 – 1 win which sends them into the semi-finals of the Irish Cup for the first time since 1997. 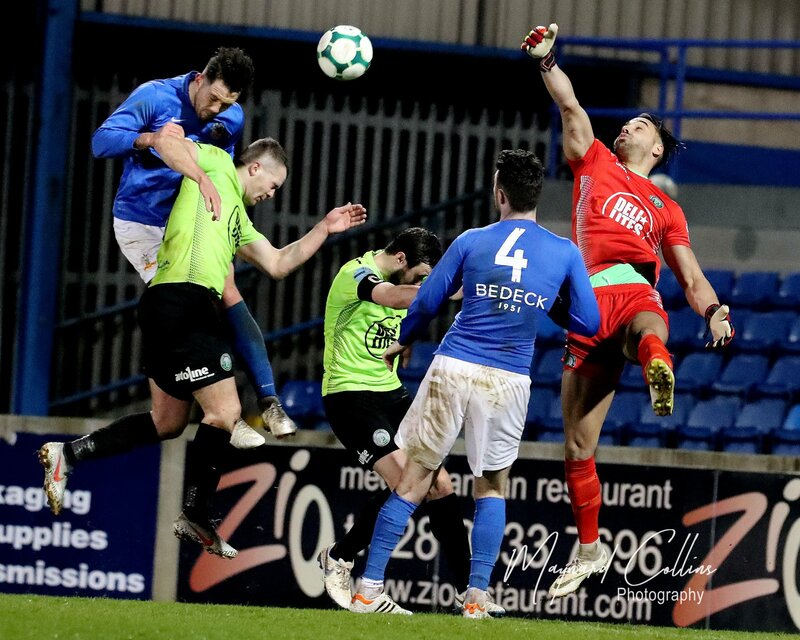 The Lurgan Blues return to Premiership action on Tuesday night (March 6th) when they welcome the league leaders Crusaders to Mourneview Park for a rearranged fixture (kick-off 7:45pm).